Chrome-plated die-cast zamak. 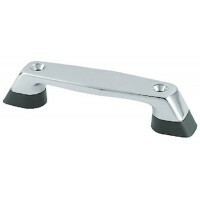 Ideal for lift handles as well as stern handles. Size: 6"Fastener: #10.. 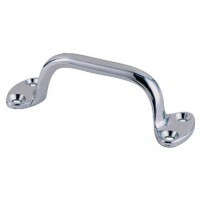 Handle chrome 5-3/4in 2/c Card: 2Size: 3-5/8" L x 1-1/4" HFastener: #8..
6in handle (2/card) Card: 2Size: 6" L x 1-5/16" HFastener: 1/4"..
Chrome plated zinc alloy. Size: 6-1/2" L x 2" HFastener: #8..
Chrome plated. Black plastic base. 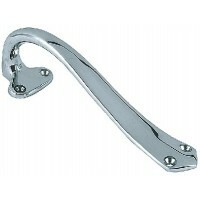 Card: 2Size: 6-1/4" L x 1" HFastener: 1/4"..
Chrome-plated cast brass. Carded. A: 4"B: 2-11/16"C: 7/8"D: 1"E: 1/2"F: 3-3/8"..
Chrome-plated cast brass. Carded. 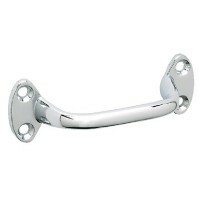 A: 6"B: 3-13/16"C: 1-1/16"D: 1-5/16"E: 3/4"F: 5"..
Chrome-plated cast brass. #10 FH fastener. Carded. A: 4-3/4"B: 2-5/8"C: 13/16"D: 1-1/4"E: 5/8"F: 4-1.. Sand cast chrome plated brass. A: 5-3/4"B: 2-5/8"C: 1-1/4"D: 1-3/4'E: 1"F: 4-3/4"..
Chrome-plated cast brass. Carded. 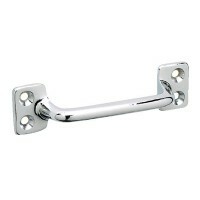 A: 6"B: 2-1/2"C: 1-1/4"D: 1-7/8"E: 1-1/16"F: 5"..
Chrome-plated zinc. Pre-drilled for (4) #10 fasteners. Carded. A: 5-7/8"B: 2-3/4"C: 1-3/8"D: 2"E: 1-..
Takes #12 RH fastener. A: 6-3/8"B: 3-1/4"Color: BlackC: 1-3/8"D: 1-5/8"E: 2-1/2"..
Transom handle-4 3/4 -cpb Size: 4-3/4" L x 1" W x 1" HFastener: #10Material: Triple ChromePlated Cas..
Transom handle-6 -cpb Size: 6" L x 1-1/2" HFastener: #10Material: Triple ChromePlated Cast Brass..
Transom handle-6 -cpz Size: 6" L x 1-5/16" W x 3-1/2" HFastener: 1/4"Material: Chrome Plated Zinc..
2-9/16" protrusion from transom. 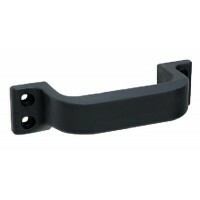 Size: 6-1/2" L x 1-5/8" WFastener: 1/4"Material: Black Nylon..